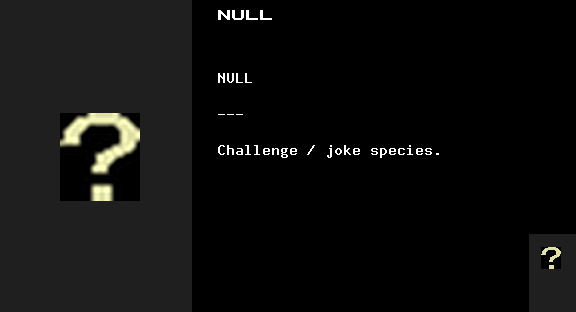 Fork is currently on pause while I try to beat Nethack. Yiuf wrote: Yiuf knows how it feels to be unloved. To be forgotten. and they can be a little family in the dark. Just like with normal Crawl, INSTALL.txt is your friend. You should read it! Crawl is pretty easy to compile on OSX and linux, and I'm going to try to upload Windows builds periodically because life is hard for y'all. A note on goals - These are old races that veteran players have had a chance to see, and newer players have not. So this is simply an attempt to collect all those dusty old races and get them working in a modern setting. I'm not gonna revert wand changes, or bring back Evaporation or revert square LOS or anything else like that. I hope someone enjoys these species! A couple were very easy to just dust off and plug back in, a couple required a major rewrite because their old code was too old and unsimilar to code currently used in crawl. Overall, a pretty fun and non-daunting project for a novice coder! Also available from the Arch User Repository! Pull requests and feedback welcome, of course. More species are on the way! Last edited by shping on Saturday, 20th May 2017, 17:37, edited 13 times in total. Berserkers start with no weapons, and no weapon skill. I must say I kinda like that. TrBe is still super-OP, but you said you took Trolls down a notch, so I guess that's fine? dracos369 wrote: you said you took Trolls down a notch, so I guess that's fine? More ogre hp, less troll hp, Formicids can't fall in shafts by accident, Items don't block doorways, Berserkers start with no weapons, and no weapon skill. Should imps keep the pants? I think it helps you not confuse your imp-self with your imp-friends and imp-enemies. You're the one with the pants! It does look pretty weird though. Do we need both ogres and ogre magi in the game, or are recent trunk changes enough? It seems like large races are covered, between the tough one (troll) and the magical one (ogre). And the weird large-but-not-large nagas and centaurs. Last edited by shping on Wednesday, 1st March 2017, 21:41, edited 1 time in total. Pants. (Or maybe a yukata-style robe if the graphics allowed...) Or else unique-looking horns or something to help imps stand out. I don't have strong preferences/knowledge about the rest. This looks like a lot of fun. It's great to see some more dramatic variety/flavors, particularly after so many "please remove" threads (serious or otherwise). Windows users, your day has arrived! Unzip it wherever you feel most comfortable unzipping. Be an imp! Or be whatever else fills your heart with song. I'd love to hear how it goes if you try it! Last edited by shping on Friday, 17th March 2017, 10:51, edited 2 times in total. How fitting that all the outlandish species can be found only in Australia. For Imp, Long Blades aptitude. The CPO in-game help % and actual training aptitude are +1. stoneychips wrote: For Imp, Long Blades aptitude. Yeah so, imps are good at LB, Mace, and Trident, to nudge players in a direction where they might end up finding and using demon weapons or something. Well in the original version, they were best with Polearms and less good with the others. Presumably, this is a kindness to help with the fact that as a Tiny species, imps can't wield most polearms. Or, it's a flavour thing based on Red Devils and other trident-wielding demons. Either way, I think it should just be the same for all three weapon categories. In the latest builds I have it at +2 because again, as a Tiny species, imps have a lot fewer options than normal weapon wielders in those categories. But a +1 apt or even a +0 for all three would probably be fine as well. readme.md wrote: Don't get too attached to apts being one particular number or another, aptitudes aren't very important in the long run. Thanks for stopping by, but this joke went right over my head, sorry! I like that Fo can't accidentally get shafted. That's one of those things I always thought should be in the game anyway. A fantastically wonderful person played 3 rune games with both imp and orc, and gave me some valuable feedback. The tldr summary: nerfs incoming for imp and LO, but on the plus side player imp teleportitis will become truly random (and less annoying). If I'm really motivated I'll turn it into a more proper, imp-ish Blinkitis, but I want to finish up Plutonian first. I don't really know all the details, but elms were a very, very ancient species that I think was removed in like .4 or something? At this point I'm not really sure if they ever really existed or it's just some joke about bad old races, I've never seen a version with them playable, I'm not sure how difficult it would be to track them down and add them, if they were ever coded in the first place. Elms were a joke where part of the joke was that you insisted it was true. The fact that a few devs (mikee, and myself in my irresponsible youth*) went along with it helped perpetuate the myth. Version 1.3 is here with two new species for your enjoyment. I have extensively tested Plutonian, but it's a race that could very easily have unforeseen issues. Cheers to PleasingFungus for identifying a bug that I caused with BAD MATH, and of course for writing the "impish insults" function for player imps! Plutonian: I have exploded... and exploded... so many times. I hope you will, too. Linux/BSD: "git clone" my repo, or download the source code from the latest release. Use make or gcc or clang or whatever you like to build it. Run the file named "crawl"! You could use Wine, too. Windows: download a win32 .zip file to play the game in a standalone folder. Or, download the win32-installer.exe and install the game! Last edited by shping on Friday, 17th March 2017, 10:52, edited 1 time in total. Hi, great work with the imps, had great fun dying by teleportitis. 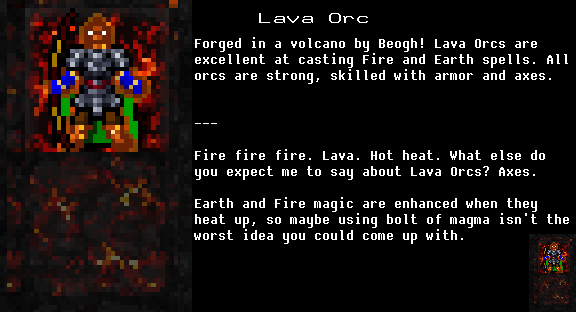 Been slashing around with a Lava Orc fighter, in ice dragon armor for most of the game. Oh well, there's been some very nice other chat too. And it's been quite fun until the usual later game jigsaw of lacking stuff. This time, I have no cMut and hardly any MR or rN. Up until that, the combo of Usk paralyzing and lava aura (which doesn't blast your allies like Qaz sadly does! whee!) has been great. What's with the NULL, btw? From what I could tell, it has absolutely no defining characteristics. Is it meant to be a joke? Oh, I realized this is under the trunk rules. So cMut is gone either way. Now I'm on an Imp online, and the Long Blades aptitude has gone down to just 0. And Short Blades has gone down to -2. Or this is how it appears in the training readout. pedritolo wrote: What's with the NULL, btw? From what I could tell, it has absolutely no defining characteristics. Is it meant to be a joke? Yep! Imp and Lava Orc got some nerfs. They seemed to be really strong in my testing, and that's the feedback I got from the player who has played this fork the most, too. There might be room to buff them back up a tiny bit later, but long blade should still be a plenty groovy option. I'm currently in my first S branch on a new, nerfed imp and it seems fine so far! Last edited by shping on Sunday, 5th March 2017, 20:16, edited 1 time in total. I dunno, I felt like the imp was kind of strong when I tried it before (to around Lair). But I'm sort of trying to explain to myself why they would be so bad with short blades -- especially if Assassin is a recommended class for them. Long claws in the way, or what? It's not as if they are big. There isn't a slightly rarer version of teleportitis that could be applied, perhaps? I haven't minded it too much yet in early dungeon given a good buff/weapon (was playing Wu Jian before). But it can make fully exploring some levels take a lot of time, as it is firing off oh so often. Good catch, the assassin recommendation was an oversight. An imp assassin focusing on the Throwing skill could be a great character, but the imp's shouting and clumsiness with subtle knives makes assassin an odd, experts-only choice. imp employs its skill with fire magic to turn its foes to ash. them to attempt the assassinations that spriggans and felids are known for. Myeh, personally not usually very excited by species with slow skills progression. I'm just too much of a packrat. But teleportitis works even under lignification. That's hilarious. Omg, so now Imp FE kiting Whirlwind with a relatively simple, +1 whip of electrocution, a touch of sticky flame. Trounces spiny frogs and yaks with relative ease for a tiny thing. Strolled into a vault on D:13 and what have we here? A slime creature (ho hum), a golem (clay? toenail? eek), and a storm dragon (omfg). Quaffs resistance, casts Blink only to land in the same room opposite them (I wanted the rest of the corridor I was in, doh), reads Scroll of Summoning and pops up some mild Lair creatures with my whole 2 Evocations, dances back and forth in front of Storm dragon getting self whittled away. Finally goes Heaven and Earth, whirlwinds and stickies the dragon some more at the mouth of the corridor on the opposite side of the vault. Tries a little barely trained Necro with Vampiric Draining for the heck of it?! Not so impressive. Imp still down at 25-ish HP and occasionally getting hit for 2-5. Gyaaaaah. Somehow manages to flee in the clouds without being blasted or pursued, and the dragon dies to Sticky Flame a couple turns later! Whoohoo. Yiufcrawl Soup (a DCSS fork) version yiuf-1.4.4-1-g2a8198c (webtiles) character file. You are on level 13 of the Dungeon. Wu Jian is greatly pleased with you. You have collected 1103 gold pieces. You have one spell level left. h - Fireball Conj/Fire #####..... 10% 5 #####.. Your bones are vulnerable to cold. All sources of teleportitis gives you blinkitis instead. You are very small and have problems with some larger weapons. You are too small for most types of armour. You frequently scream uncontrollably at your foes. You are often teleported next to monsters. Your resistance to elements expires. You feel a little less agile now. You see here a runed shortbow. You can't go down here! 0 | D:1 | loopi the Imp Fire Elementalist began the quest for the Orb. 1707 | D:2 | Found a hide-covered altar of Uskayaw. 1903 | D:2 | Found a runed door. 3218 | D:3 | Found a snail-covered altar of Cheibriados. 5935 | D:5 | Found a staircase to the Ecumenical Temple. 6242 | D:5 | Found a radiant altar of Vehumet. 7847 | D:6 | Found a shadowy altar of Dithmenos. 8088 | D:6 | Found a bloodstained altar of Trog. 13417 | D:9 | Found a sparkling altar of Nemelex Xobeh. 14059 | D:9 | Found a staircase to the Lair. 21573 | Lair:2 | Found a hole to the Spider Nest. 24385 | D:12 | Found a staircase to the Orcish Mines. 24388 | D:12 | Found Xyarche's Armour Emporium. 24494 | D:12 | Found a glowing golden altar of the Shining One. Just a note: scrolls of summoning don't care about your Evo skill. The results depend on what floor you are on (like casting Shadow Creatures). Nope, no shops in Orc: 1 and splat in Orc: 2, too many overarmed knights. I've been pushing new minor versions to CPO and the release downloads over the week, but nothing big enough to be worth announcing in each version. Here are some highlights! Yiufcrawl is now in the Arch User Repository! Which, hey, it's not a tough trick to get in the AUR, but it's really awesome to me that someone packaged it up all nice for us. I should have mentioned that we are currently borrowing SteelNeuron's skeleton race, but you probably saw it over in the Skeleton thread. Steel would love your feedback if you try it out! The README has gotten some updates. Imps now do the proper impish thing and blink randomly instead of teleporting randomly! I see we have many impish ghosts on the server, so people must be enjoying it. One interesting direction that imps could take: transform all teleportation into uncontrolled blinks, including teleport scrolls. This would make it a more challenging and perhaps "interesting" race to play, and could allow for buffing the species in some other way. Hit up ##crawl-forks on Freenode if you want to chat about imps, yiufcrawl, hellcrawl, gnollcrawl, OOFcrawl, or any other fork! 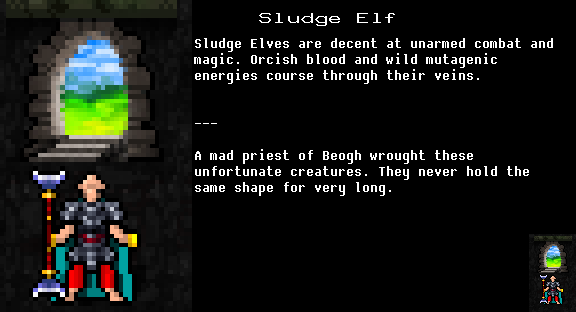 Reminder: Sludge Elves aren't just another Elf! They have a permanent Evolve mutation! That should be fun for some folks, I'm surprised I don't see a bit more people playing this one. Thanks for trying this fork! It may soon be hosted on a new webtiles server in North America. Annoy someone named "Dracunos" for more info! Last edited by shping on Friday, 17th March 2017, 10:53, edited 1 time in total. 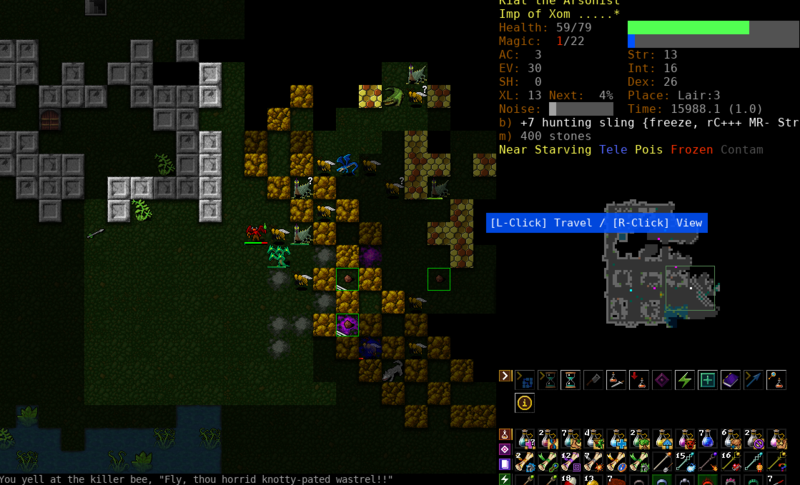 New Imp on D:5, having picked up a nice pile of consumables from a good run of the Ostuary. ... Ohhhh, HOLY WORD. Hmm, here's a nice lovely patch of Dungeon floor for you to decorate. I'll be blinking off in this direction now!" Dark, dark acquirement sense of humor strikes again!
" Ahhh, I see NO tridents have appeared yet anywhere in this dungeon! But really, isn't a runed demon trident just the sort of thing an imp like you is supposed to be carrying?? Here, take this!" Question: Why aren't player imps immune to Torment? Was it just a balance thing? Not trying to get OP, just sort of "why"? Of course it's still available on CPO as well! It will have version 1.5 sometime tomorrowish. 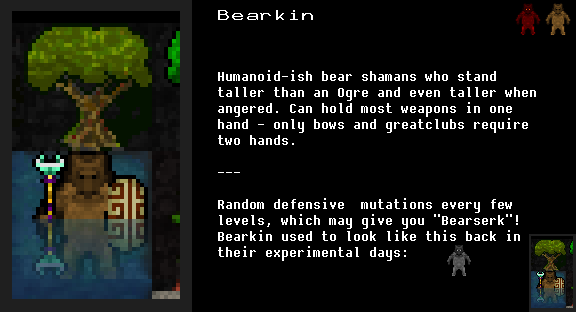 - Random mutations every 3 levels, from a bear-appropriate subset of mutations. Think of it as "Demonspawn lite", except it's a "heavy bear". I've changed the repo name to "yiufcrawl" to avoid ambiguity with Stone Soup's repo. This also makes text searching work properly on github, and makes my repo stop sending unnecessary PR build test reports into the ##crawl-dev channel. 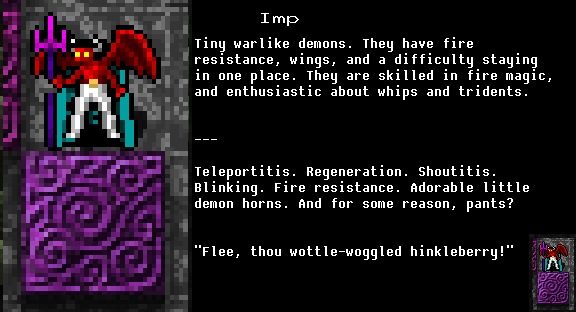 And yes, by very popular demand, Imps are immune to torment as of a couple versions ago. I apologize for using the bump button, I had to see what it does! edit: can anyone read japanese? I found a link to yiufcrawl on "shitaraba.net". I'm a bit curious what they have to say! Could there be room for ghost draconians? I think it'd be fun to play one. 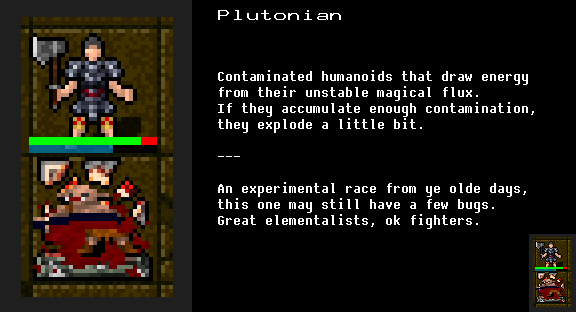 Gonna post some plutonian feedback now that I've had a chance to play a PlAE down to D:15. Plutonians are kind of annoying as casting starts for contam reasons, I hit high contam a couple times from miscasting lightning bolt. I guess in principle this means you want really low fail rates or sif (or a way to clear contam quickly). Any significant amount of backtracking can semi-permanently weaken your character because of the max hp rot on high contam explosions. Ghoul has rotting too, but ghouls can also unrot for almost free instead of having to chug a !hw. Think I've rotted over 30 max hp total over the course of this game, though perhaps I am just playing too slowly. Might be nicer to just drop hp to -20% and replace the rotting with some temporary malus. I only used the activated ability to explode a couple times. Seems strong but is also hella loud. Not sure whether it'll still be useful later on. I can still eat permafood for some reason. Does this actually do anything? High mp regen is cool and fun even though it probably doesn't affect power level that much. Would like to see it even higher at high contam tbh. Game has still been pretty fun, found an early +8 freezing war axe randart and then gozag let me buy Eos at the end of lair so I started turbomurdering everything with that + airstrike/lightning bolt. Hellmonk wrote: Gonna post some plutonian feedback now that I've had a chance to play a PlAE down to D:15. Numeric contam display is definitely planned. The trouble with the status light is that changing what counts as "safe" for a pluto also affects the status light. Berserkers also regularly find themselves detonating from extreme contamination, so I think I'm actually going to go back to the "normal" effect of contamsplosions, which is mutation. That way heal wounds potions don't have to do triple-duty as rot removal, major contam reduction, AND healing hp. Extreme contamination as written is somewhat of a punishment, whereas Overload is not (but it does increase your contam, so...). Perhaps overload could reduce contamination instead, acting as a sort of "safety valve" for your contam that also hurts and makes a lot of noise, but at least doesn't mut (or rot) you. That would remove the Pu feature/bug/challenge of having a real and never-ceasing clock to pressure you forward, but maybe crawl is not meant to have clocks. Food is edible because potions and food are tied together. If you have a foodless race, you have a potionless race. Food doesn't do anything for Pu, however. shping wrote: edit: can anyone read japanese? I found a link to yiufcrawl on "shitaraba.net". I'm a bit curious what they have to say! , now with keen eyes, a Tolkien-friendly bonus to noticing traps. now with a host of evolving mutagenic body issues and orcish blood. 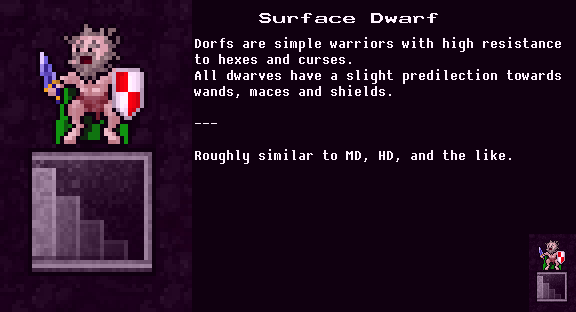 , your basic Dwarf, based loosely on Hill & Mountain dwarves. High MR and rN to keep your life simple. , as their heat increases, they get a fire/earth magic boost and a damage aura. , a short-lived experimental race. Their undead-like resistances have been simplified to just rN+. , an unstable, contaminated humanoid that occasionally explodes. !Curing and kills reduce contam. These don't seem like they have that many special mechanics though? I'm looking forward to the bearkin mutations being stabilized so they can synch with the usual mutation roulette. It's an interesting species with a bit of everything to choose from (unarmed combat potential with teeth and claws but no armor at all, cold resistance, stealth and at the moment short blades though that strikes me as rather counterintuitive, carnivore a la kobold, emergency "bearserk" a la regular bears, some fighter backgrounds and some caster backgrounds). And the character icon is pretty cute! Oh I see, the bearserk is a semi-random mutation. Those are pretty fun anyway. I had a full rC+++ by mid-Dungeon on one character. I still think removing ghosts is a bum idea -- they added variety and someone is always going to be along to say, this makes the fork far too different from the regular game. But other than that, I generally quite enjoy this fork so far. Oh, it seems ghosts have come back? And I am duly slaughtered -- I mean, amused! -- again. Yay. Yep, you've successfully pestered me into bringing back the occasional ghost. Still no major progress on the known bearkin bug, but I did finally cross off the "make deep elves vewwy quiet" to-do that was hanging on the readme! So that means the "elf or elf like" pantheon of species each has a little quirk: water stuff and crazy apts for merfolk (as dcss), flying stuff and crazy apts for tengu (as dcss), blade+bow crosstrain and trap perception for high elf, orcish blood and perma-Evolve for sludge elf, big xl1 MP (as dcss) and reduced noise for deep elf. Hooray! 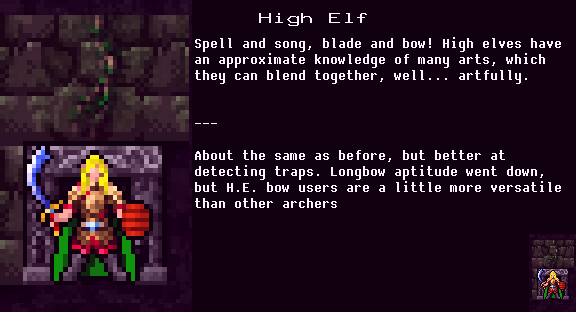 If you notice any heavy overlap between elfy or semi-elfy species, do let me know, otherwise I'm pretty happy with them for now. The dwarves+orcs gang is probly going to need some attention, after bearkin fixes. Last edited by shping on Friday, 7th April 2017, 00:09, edited 1 time in total. Hey Tavern. A pile of small updates have gone by and we're now at version 1.5.4! I haven't said much about the last few versions, because I haven't been able to complete any of the bigger changes I'm working on, but there's been enough small changes that it's time to compile a new binary release! Many improvements to the Bearkin species, though I still consider Bearkin and Plutonian a bit unfinished and in need of further work. Humans, Kobolds, Deep Elves, Ogres, and Formicids have fun little tweaks that are described in the species selection menu when you start a new game. This is part of a shift from trying to describe changes in the README and changelogs, which some people don't read at all, to describing additions and changes clearly in the game. Do please let me know if any such description is missing or unclear!